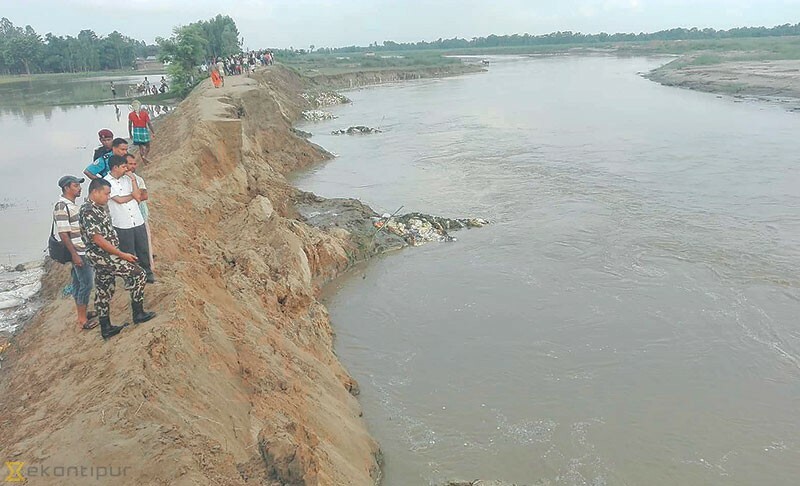 Dozens of villages in Rautahat district face high risk of floods after swollen Lalbakaiya and Bagmati rivers destroyed embankments last year. The floods caused by the rivers had destroyed embankments at 31 places in the district. People living in Bhaudhimai, Laukaha, Katahariyam, Gaur, Samanpur, Dharampur and Gadhimai among other areas are at risk of floods. The local administration has requested people living near the rivers to stay alert. People said they are having sleepless nights due to fear of floods these days. Chief District Officer Govinda Prasad Rijal said security personnel have built temporary embankments in the rivers, but, there are doubts it could hold the pressure exerted by massive floods. Though the Water Induced Disaster and River Control Division Office started repairing the embankment since mid-May, the onset of monsoon disrupted maintenance work. Division Office Chief Raj Kumar Shreebastab admitted they could not repair the embankment on time. Last year, floods killed 17 people and displaced hundreds of families in various places of the district. According to the division office, they could not repair the embankments on time due to financial crunch. Meanwhile, people in Lalbojhi of Bhajani-5 in Kailali district too quiver in fear at the looming threat of floods triggered by Kandra and Mohana rivers. There are 14 families living in Lalbojhi surrounded by Kandra and Mohana rivers. Puran Chaudhary, a local man, said they have to relocate from their village after it rains heavily. People said the rivers also destroy 20 to 30 bighas of lands and damage crops planted in hundred bighas each year.